The Arbor Day Foundation was founded in 1972 with a mission toward conservation and education. It’s the largest nonprofit membership organization dedicated to planting trees—they planted over 8.7 million trees last year alone! 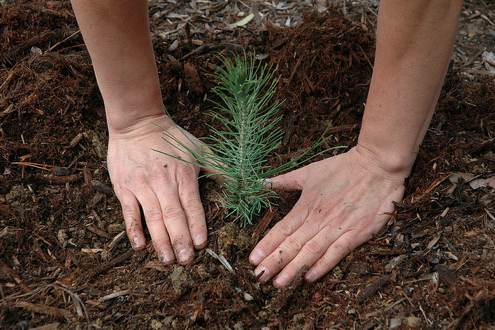 When you join the Arbor Day Foundation, for a $10 fee, they will either plant ten trees in the nation’s forests or send you ten trees to plant yourself—along with a few other membership perks. While the election of trees is based on what grows well in your geographical region, you can choose from a package of 10 Flowering Trees, a 10 Trees Mix, 10 Wild Bird Garden Trees, 10 Eastern Red Cedars, 10 Oak Trees, 10 Redbuds, 10 White Pines or 10 Autumn Classics. Your ten trees will be small—very small. The diameter of a pencil and a foot tall, if you’re lucky. They’ll need to be protected for a couple of years, but before you know it, these new trees will be contributing to the beauty of your landscape in major ways. I chose the 10 Trees Mix, which includes Sugar Maple, White Pine, Colorado Blue Spruce, River Birch, Silver Maple, Red Oak, Pin Oak, Red Maple, White Flowering Dogwood and a Redbud. I can’t wait to get my seedlings in the mail! My family will have fun planting them in large containers, which I’ll do so we can move them to shelter when the winds pick up in our area. Once they are a little bigger and stronger, we’ll move them to their permanent home in the yard. 1. Transplant. Plant your seedlings as soon as they’re received in order to give them the best chance for survival. 2. Moist Roots. Seedlings have fine roots that can dry out quickly. Carry them in a bucket with moist material packed around the roots to keep them damp. 3. Location. Choose an area that is free from grass, weeds, or other trees and plants. Seedlings can’t tolerate much competition, so keep them well off on their own. 4. Planting. 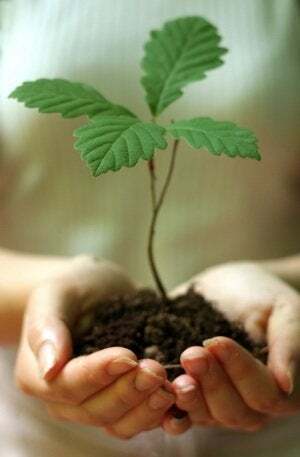 Plant your tree at the same depth as it is packed in soil. No higher, no lower. Make sure your hole is deep enough for the roots of the seedling to extend down fully, straight. Curled or bunched-up roots won’t be able to take up water properly. Allow soil to fill in around the roots, tamping it down frequently to remove air pockets, which can dry out the roots. You probably don’t need to water your new trees more than every seven or ten days. Give them a good soak, then let them dry out between waterings. This encourages the roots to grow down in search of water, which will make the tree more stable in the long run. You can also mulch around your tree to help keep moisture in the soil, and if you want to protect your trees from foraging animals (or the lawnmower), you might want to add some light fencing or a landscape border. Planting a seedling can give you great satisfaction. You’ll be rewarded in watching it grow, and it’s a gift you can give the Earth that will last for generations.